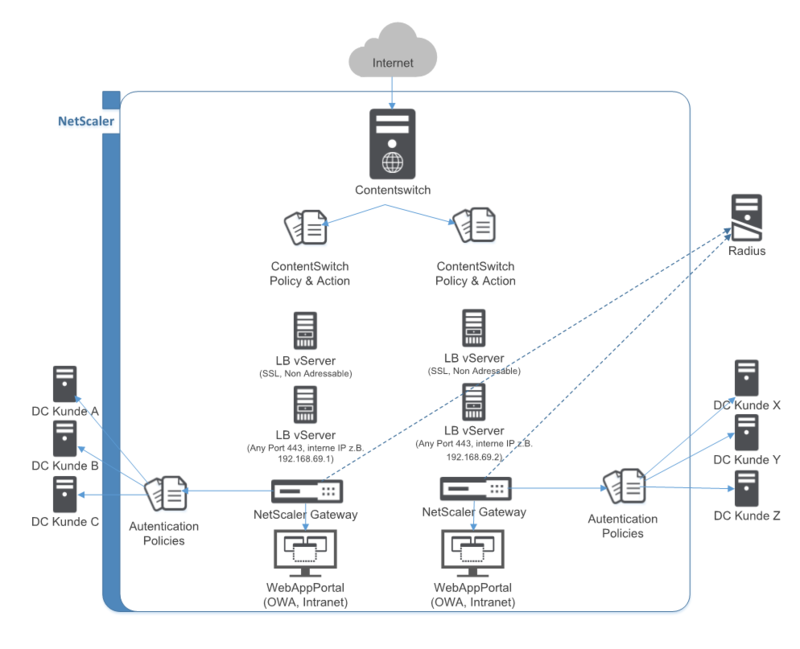 This is a work around for a well-known problem in NetScaler: Binding NetScaler Gateways to content switching vServers. This solution does not follow Citrix best practices. Avoid using it, if you can! My solution will work with NetScaler 10 upward. I didn’t test with 9.x as they are not considered to be secure any more. Up to 11.0 it was impossible to bind a NetSaler Gateway to a Content Switching vServer. By now (firmware versions 12) this is limited to a single NetScaler Gateway. This limitation may be an obstacle to overcome in certain environments. Most companies nowadays suffer under a lack of public IPs. But mos of all: Users don’t like complex environments with tons of different URLs to handle, one for mobile devices, one for PCs, one for trusted, one for untrusted devices and so on. Instead they want to use a single URL for all use cases. Content switching may mitigate this issue by hiding very different configurations behind a single URL. But this is not true for NetScaler Gateways. In days of old we could not bind any gateway to a content switching vServer at all, now (starting from version 11) we can bind a maximum of one gateway to it. Why may one gateway not be enough? First of all, it is complexity. It may confuse you if you have to bind tons of different scenarios to one gateway. In my real world experience I see often buggy environments being buggy, as complexity may over work the admins. But there may also be technical reasons. One of my costumer would have to bind round about 50 LDAP sources of costumers and partners. All of them are geographical dispersed and some of them may even be misconfigured and therefore slow. Logon to the last ADs in the list would be painful. Splitting the gateway up into some gateways would speed up things very much. This question came up in one of my NetScaler classes. We set up all needed NetScaler Gateways. They are addressable and use private addresses of a separate address space (this address space does not exist outside of NetScaler). We set up a content switching vServer. I would prefer a SSL-bridge to avoid SSL offloading, however we needed something to base content switching on, so we used a SSL vServer. This is far from being a perfect solution, but it works. How to bind them together? My first thought was: pointing the services of the load balancing vServer to the NetScaler gateways. But this does not work, we faced an error stating this IP address is already in use. That’s my trick: I create load balancing vServers of type ANY and point its services to the corresponding gateways. That’s why these gateway servers use private addresses that don’t exist in your environment. This traffic will never leave this NetScaler. What’s wrong about this setup? It does not follow Citrix best practices. So you should avoid using it. On the other hand: everything we do is fully supported: The content switching vServer, the load balancing vServers bound to it, load balancing vServers of type any, and last, not least, the gateways. We won’t be able to log on to the NetScaler Gateways using smart cards (certificate based logon), if we use SSL-Offloading lb vServers, as these certificates won’t be visible to the NetScaler Gateway. Why would you use it even though? It’s currently the only chance to bind more than one NetScaler Gateway to a content switching vServer on a NetScaler. very good description – well done ! I would love to get some more details on this setup, as im currently in need of exactly this. Pretty new to advanced NetScaler use, so having som trouble putting it all together. Any contact on email would be much appreciated. Hi Johannes, can you sent me also some more information details on your solution. Need it too but could not get it working so far… ) Thank you in advance! 2 – displaying the login page for the gateway with the lower priority in the content switch confit takes considerably longer – say, 10-15 seconds. Oh. It’s hard to answer. We would need to do network traces to find out, what’s wrong about HDX connections (A), and where we loose time (B). It should not be like that. It seems like you did everything right when you are able to log on OK. The problem with what I am in now, is exactly the configuration you propose, but I can not understand, how you make the connections between the different VS. Could you give me more detailed information on the configurations and how to do them? If you can send me an email with explanations, I would greatly appreciate it. I don’t fully understand your question. It’s just IP communication. Traffic is flowing through the CS vServer, to lb vServers. The servers of the services of these lb vServers point to the IP of another lb vServer type any. This is possible. And these any services (their servers) point to the gateways. There are 10 NetScaler Gateways, IP 192.168.2.1 to 192.168.2.10. I kept thinking about cs- policies: If you go with the server name (gateway.company1.com, gateway.company2.com, …) you could create SSL bridges and use the SNI information included in SSL Cient Hello. Hi Joannes, I have a single Netscaler gateway setting with 2 gateway server, one for VPN and one for xendesktop, with 2 IPs respectively. I have created a content switching server based on the domain names to switch to different gateway because of lacking public IP address , and of course I failed. I only can bind 1 gateway. Can you give me more details how the setup of the trick,, I have no idea how to set “point it’s service to corresponding gateway”, your help is appreciated. so far so good, all is up. Now when creating the virtual server things go wrong. I tried to use type ANY and SSL, but it keeps complaining about incompatibility with the load balanced virtual server, created in load balancing part. If I do the same as above, but do explicitly specify a LBVS, it says The target vserver is not compatible with the CS verver. If I create a CS VS of type ANY, and try to add the policy I can”t get it work either, Tried all kind of combinations, also with cs policy labels etc. If you could give me a hint, would be great! I create 1 cs vServer. This one selects load balances lb vServers. Their services point to a load balancing vServer of type ANY (no port), loadbalancing 1 service of type ANY (no port). These services point to the NetScaler Gateway. So t’s a CS-Vserver with 2 cascaded lb-vServers behind pointing to the NetScaler Gateway. We are using all type ANY here, so how can the content switch policy determine where to go to? What fields do we have available here? The target vserver is not compatible with the CS policy expression. Which kinda makes sense, because ANY does not contain those fields, the evaluator has only TCP information, which is kinda useless in this scenario. You need to give the content switch something to decide upon, right?